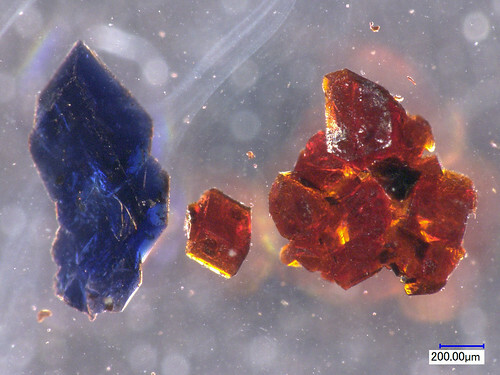 One flask of chemicals gives rise to either blue or orange crystals. RICHLAND, Wash. — Chemists have unexpectedly made two differently colored crystals - one orange, the other blue - from one chemical in the same flask while studying a special kind of molecular connection called an agostic bond. The discovery, reported in Angewandte Chemie International Edition on July 29, is providing new insights into important industrial chemical reactions such as those that occur while making plastics and fuels. "We were studying agostic bonds in a project to make liquid fuels like methanol from carbon dioxide to replace fuels we get from oil," said chemist Morris Bullock at the Department of Energy's Pacific Northwest National Laboratory. "We knew the molecule we were making would have an agostic bond, but we had no idea there'd be two flavors of these metal complexes." While chemists have studied these bonds in chemicals in liquid form, no one had crystallized one chemical with multiple forms of its agostic bonds. And no one expected different forms to give rise to different colors. Bonds come in many varieties in molecules. They string atoms together, sometimes forming a trunk and branches of atoms like a tree. But the trunk and branches of chemicals often fold up into a more compact shape, requiring additional weaker bonds to hold the shape in place. An agostic bond is one of these additional bonds, a shape-holder. They occur between a metal and a distant carbon-hydrogen bond along some chain, folding the chain back to the metal and pinning it there. First discovered in the 1980s, agostic bonds frequently occur in catalysts because catalysts usually contain metals. This work will help researchers get a better handle on some catalytic reactions found in common industrial processes such as making plastic or fuels. The metal in a catalyst is usually the reactive heart of the molecule. Bullock and postdoctoral chemist Edwin van der Eide knew an agostic bond in their catalyst would help protect the reactive metal from working at the wrong time: The carbon-hydrogen bond blocks the reactive metal until conditions are right, which in turn would help the scientists better control the catalytic reactions. So van der Eide set about producing and crystallizing catalysts that contain a metal atom — in this case, molybdenum. In the lab, van der Eide's flask of chemicals held a molybdenum-containing molecule that turned the solution violet. He added another liquid to coax the molybdenum complex to crystallize, just as salt crystallizes from seawater to form flakes at the seashore. Some crystals formed at the bottom of the flask and others formed near the top of the violet solution. Oddly, the crystals were two different colors. Orange crystals formed at the bottom of the flask and blue above. If van der Eide dissolved either the orange or blue crystals in a fresh flask of the original solvent, the violet color returned, with the same properties as the original violet solution. These results suggested that either molecule in the two colored solids could give rise to both structures in liquid, where they easily change back and forth. 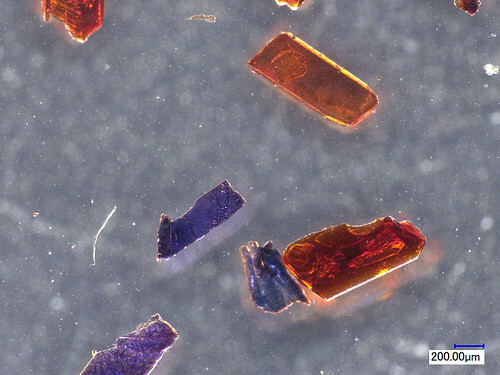 The researchers examined the differently colored crystals to determine their structures. The molecule forms a shape like a piano stool: a ringed section forms a stool seat on top of the molybdenum atom, with multiple legs connecting to the molybdenum at the bottom. One of the legs, however, is longer than the others and contains a chain of three carbon atoms, each with at least one protruding hydrogen. The team found that the long leg was involved in the agostic bonds, with the middle carbon atom involved in the orange crystals and an end carbon involved in the blue crystals. PNNL's Ping Yang at EMSL, DOE's Environmental Molecular Sciences Laboratory on the PNNL campus, took to EMSL's supercomputer Chinook to perform theoretical calculations on the orange and blue structures. Chemically, the two structures were almost equally likely to form, with the blue one having a slight edge. The analysis also revealed why the crystals were different colors, which is due to subtleties within the structures. Reference: Edwin F. van der Eide, Ping Yang, and R. Morris Bullock. Isolation of Two Agostic Isomers of an Organometallic Cation: Different Structures and Colors, Angewandte Chemie. July 29, 2013, DOI 10.1002/anie.201305032.